Manhattan Beach Homes are part of a safe, idyllic community – in fact, I often liken it to Mayberry of the fictional TV series. But in a city with a remarkably low crime rate, residents sometimes become complacent about their safety and unintentionally invite crime by leaving doors unlocked or valuables out in the open. The chief of the Manhattan Beach Police Department said at a public forum this year that over 90 percent of vehicle burglaries in Manhattan Beach involve cars that are unlocked or displaying valuables in clear sight. Over half of home break-ins do not involve forced entry. This is why the Manhattan Beach Police Department is running a “Lock It or Lose It” campaign to remind residents to lock up – and avoid falling victim to crimes of opportunity. As technology advances, homeowners have access to a wider range of home security devices. 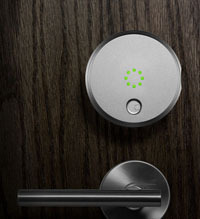 The “smart lock” might be the newest and most convenient home security gadget on the market. A smartphone app manages the bolt, controls who unlocks it, and records all comings and goings. If you have your phone in your pocket, all you have to do is touch the lock icon with one quick tap. The lock can tell whether you’re inside or outside, meaning if you’re inside the house with your smartphone, the lock won’t open if it’s tapped from the outside. Several different brands are selling smartlocks, and we’re highlighting the top 3 that we found. - Allows for “digital keys” to be distributed to your friends, family members and cleaning crew. You can give someone access to your home for only a few hours if necessary. - They have a “fob key” that allows you to open your door with a single touch. No phone necessary. This feature is great if you have kids and want to give them easy entry into the home. - They also have programmable “fob keys” for kids. - Doesn’t have regular key entry. They do provide an emergency key in case all other forms of access are lost/damanged. With ever changing technology, it is now easier than ever to be safe and make sure your home is locked up properly. Living in a safe neighborhood is an incredible luxury but it also may make some of us lax on our home security. With smartlocks you can have effortless home security with only a few clicks. If you’re unsure about the security of your home you can schedule a security inspection with the Manhattan Beach police department. The city is doing everything possible to help residents stay safe.